Edited 12/4 to show changed trust bits. Microsoft's official announcements are now at aka.ms/rootupdates, also Jody Cloutier who manages the program has been posting notices on the CABForum mailing list. Below is a summary of the last few updates, including detail on the November updates. August 2015 update just added additional trust bits for two Certificate Authorities, allowing them to be trusted for more purposes. "Guang Dong’s root, GDCA TrustAUTH R5 ROOT, for EV (Extended Validation)"
"Government of India, CCA’s root, CCA India 2015, for Server Authentication and Code Signing"
September 1, 2015 was an unscheduled update to replace a root that was allowed to expire. "an unscheduled update to the Trusted Root Store to update the expiration of the A-Trust-NQual-03 root." November 23, 2015 includes the addition of four new certificates and removal of 10. No new Certificate Authorities joined the program this update. Hellenic Academic and Research Institutions added two new certificates. Along with adding ECDSA, these look to be planned replacements for the existing roots that will retire in 2018/19. I.CA of Czech also appears to be planning for expirations. China Financial adds one new root that is only trusted for Document Signing. Symantec retired five old certificates. Entrust retired a 1024 bit root certificate. Comodo retired a Usertrust root expiring in 2019. Unizeto CERTUM retired a certificate, I think based on bugzilla they are reissuing a new one due to BR updates. Camerfirma is retiring a 2047 bit root certificate, legacy of old buggy software. SG Trust Services (Societe Generale) seems to be out of the program. LAWTrust Root Certification Authority (New Zealand) removed Server Authentication certificate purpose. The only change affects the CNNIC, China Internet Network Information Center. Two Root Certificates from CNNIC were removed from the Trust Store, and a whitelist of previously issued certificates were added. Apple says: "An intermediate certificate was incorrectly issued by the certificate authority CNNIC. This issue was addressed through the addition of a mechanism to trust only a subset of certificates issued prior to the mis-issuance of the intermediate." The CNNIC / MCS incident received substantial coverage, I won't rehash it here but link to the major primary source commentaries. While the CNNIC root certificates are not trusted, Apple added a lot of existing certificates issued by CNNIC before April 1, 2015. Comparing to the actions others, it seems Google (1) is using the "publicly disclosed whitelist" while Mozilla (2) decided to implement a date based approach. Mozilla has a tracking bug for items that CNNIC must address in order to get reinstated. Apple provides more information about the "partial set" of CNNIC issued certificates that are being grandfathered in. Some interesting entries are below. These don't appear to conform to EV baseline requirements (unqualified) unless the hostname is just not printed correctly, or they may not be server authentication certificates. Five are already expired. The unqualified names appear to be be CNNIC internal for PKI operations (RA=Registration Authority, etc). This list has 1429 certificates, 318 of which are expired. I picked out some hosts below that are of interest. I checked a few sites to see if they are reachable, and wasn't able to verify any. I did find a few that are using WoSign certs (www.escience.cn) for example. The addresses in the table below might be CNNIC internal (RA means Registration Authority in a PKI for example). We have been included in Microsoft root store. This has been confirmed by Jody. 5 new root CAs will be available in Microsoft June release, planned on the 23rd. If you read my previous post on the Microsoft Certificate Trust List you'd know that it's hard to anticipate Microsoft certificate trust list changes. I checked this afternoon, yes, the CTL was updated. Some quick analysis of this change, which added 17 Root Certificates and removed 1. Several of the new certificates are not trusted for Server Authentication. There are a few new Certificate Authorities, of which I don't have much information. Microsoft Used to document these changes, for example linked below. Maybe they will start announcing trust changes again soon. The last update is a PDF released in September 2014, which welcomed Saudi Arabia's CA. sha1sum "Windows Root Certificate Program Members - Sept 2014.pdf"
Update, three of these are ECC 384 bit Roots. Trusted for Client Authentication, Secure Email, and Document Signing. "Notarius is a non-profit organization founded on 19 June 1996 by the Chambre des notaires du Québec (CNQ). Certified ISO 27001:2005, ISO 9001:2008 and recognized by the Conseil du trésor du Québec, Notarius issues digital signatures to Canadian professionals and their business partners." "Försäkringskassan’s role is to administer social insurance and to ensure that you get the benefits and allowances you are entitled to." "MULTICERT has started its business activity in 2002 with a group of 16 employees. Over the years, we have consolidated ourselves as project developers and as a digital security solutions company, bringing our expertise and technical knowledge into the electronic certification field. Our expertise has been acquired in several projects in which we participated, both in the banking and government sectors." Home page is anchored to old revoked root. "GlobalSign is a WebTrust-certified certificate authority and provider of Identity Services. Founded in 1996. and presently a subsidiary of GMO CLOUD K.K. in Japan, the company offers a diverse range of Identity service solutions." Contents: This field MUST contain the two-letter ISO 3166-1 country code for the country in which the issuer’s place of business is located. This is the 1024bit Equifax root. This week (June 11-12) saw a lot of buzz around the Workshop on Elliptic Curve Cryptography Standards #ECCWorkshop held at the United States NIST. This provided a dramatic mixture of high math, high drama, public policy, and painful attempts to avoid mentioning Edward Snowden. In his presentation, Rick mentioned the number ECC Roots that are currently supported by browsers. These are all signed using the old NIST curves P384 and P256 (GlobalSign R4). While it might seem that the (hopefully) new standard curves would make these irrelevant, in fact they are probably going to be used to sign new intermediates to bootstrap the trust, to avoid IP issues with the RSA roots (or the other way around). All of the ECDSA certificate authorities are based in the United States (Entrust appears to have a Canadian parent). Symantec owns Verisign and Thawte, so there are really only 5 Certificate Authorities that offer ECDSA certificates. All of the CAs belong to the CA Security Council , which is appears to be a marketing council not very unlike the National Dairy Council. The presentation is comprehensive (go watch it, I'll wait), but while he summarizes the certificates and roots he didn't provide a table listing them, so here is one, along with Test URLs where I could find them. Symantec has 5 trusted roots, I don't see the G4 roots on their roots page, and can't find test urls for them. They don't appear to have submitted them to Mozilla or Android which would make the test urls public. The Verisign root is documented as not being in use. * "VeriSign Class 3 Public Primary CA - G4 Description: While this root is not being used today for Symantec's commercial certificate offerings, it is an ECC (Eliptic Curve Cryptography) root that will be used in the future to as the root of Trust for Class1, 2 and 3 certificates ECC certificates and should be included in root stores. ?" ** AffirmTrust ECC root test page uses the wrong hostname (commercial.affirmtrust.com) rather than "premiumecc.affirmtrust.com"
*** The Symantec Class 1&2 G4 certificates don't have test URLs listed in the bugzilla submissions, suggesting they are "non-SSL" roots. This can be confirmed with certutil on Windows. CertUtil: -verify command completed successfully. **** The Comodo & UserTrust ECC roots are not directly trusted by Android or Apple. However, Comodo has cross signed intermediates to other roots that are trusted, so these links work, but the trust is asserted using sha384withRSA. *5 GlobalSign says "ECC Certificates (Not yet in use.)". In what is probably just a case of great minds thinking alike, the US House of Representatives Energy & Commerce committee sent letters to the browser vendors asking about restricting government CAs. "Microsoft Trusted Root Certificate: Program Requirements"
I think so this is when it was changed. There is no date or version on the page, unlike the former version you can't tell when it changed or view revision history. The previous version was at the link below, which shows the history which was updated to redirect to the page above. The second to last word on the current page is a typo "thhhe", when that is fixed we'll know something changed, but what... (I archived it). "7. All roots that are being used to issue new certificates, and which directly or transitively chain to a certificate included in the Program, must either be limited or be publicly disclosed and audited." This seems to mean Intermediate Certificate Authority Certs require WebTrust / ETSI audits, or constraints. This is great news, many of the breaches in the past have been from sub-CAs, including the recent CNNIC incident. "8. Government CAs must restrict server authentication to .gov domains and may only issues other certificates to the ISO3166 country codes that the country has sovereign control over (see http://aka.ms/auditreqs section III for the definition of a “Government CA”). 9. Government CAs that also operate as commercial, non-profit, or other publicly-issuing entities must use a different root for all such certificate issuances (see http://aka.ms/auditreqs section III for the definition of a “Commercial CA”)." These are changes that people have been clamoring for, for example concern about US and other government Certificate Authorities being able to issue general server authentication certificates. Transparency. Mozilla provides a good example, everything is transparent. Microsoft might want to allow applications to remain non-public during the initial process. However, this is PUBLIC Key Infrastructure, customers have given MS their trust. Once a CA is accepted and scheduled for distribution, customers should have the opportunity to review the criteria and decide whether to accept or block the trust. NIST.SP.800-52r1 section 4.5.2 requires administrators to manage the certificate trust list. Minimum transparency would include a public notice after Step 2 of the intake process, along with public comment period. Public comments are normal for IETF, NIST, and other standards discussions, and could occur here. There is a possibility that the public may have strong, even misguided opinions but a robust public process can survive public discourse. When the new update to the Root Certificate Trust list is released, it should include advance customer notification such as through the Security Bulletin process. Analysis of the "List of available trusted root certificates in OS X Yosemite"
In the OS X Security update 2015-004/Yosemite 10.10.3, Apple updated the Certificate Trust List, or "CTL". The CTL is the list of Certificate Authority Certificates (CA Certs) that the browser and operating systems trust for establishing secure web connections (SSL/TLS, aka HTTPS). Apple has been posting the list of certificates in the past few updates, which is a good step toward being more transparent, after all transparency is a critical requirement for Trustworthiness. However, the list falls short. For a normal user, it's a bunch of gobbledygook. For technical analysis, it is missing the key element (SHA1 Fingerprint) that is used to uniquely identify a certificate with high certainty. Additionally the list doesn't explain what changes have occurred since the previous release, and why. To really analyze it I had to compare extracts of the different certificate trust lists, made available on github by other researchers. Briefly for the "normal user", the CA Certificates are each controlled by a Certificate Authority (CA). Each CA may own more than one "Root" Certificate, for example they may have different expiration dates or support different features, or the CA may have acquired other companies and not yet transitioned customers to their own "Root Certificates". The Apple Certificate trust list determine basically what CAs Safari or Chrome will trust, which means where websites can purchase certificates for secure web sites. (FireFox has it's own list). For the "Technical user", including those required to manage their organizations' Certificate Trust Lists, below is a breakdown of the certificates added and removed, and some inference as to why. Overall this change from 10.10.0 to 10.10.3 includes welcome cleanup and reasonable preparation for future security requirements, but it's hard to tell that from the bulletin. One new 4096bit CA Certificate for existing CA "ANF Autoridad de Certification" in Spain. Two new 4096bit CA Certificates for existing CA "Identrust", in the United States of America. Three new 4096bit CA Certificates for existing CA "QuoVadis Limited"
QuoVadis is a WebTrust audited, CabForum member, with current CPS & Audits, in Bermuda. 8 of these were 1024bit RSA certificates, removed as the industry is transitioning to 2048 or larger RSA Certificates. 1 From SwissSign, 2048bit root retired in favor of 4096bit roots. 2 from TDC Internet.DK, a Danish CA. Denmark moved to "OCES" certificates for identifying people, so these companies no longer issue x.509 certificates. 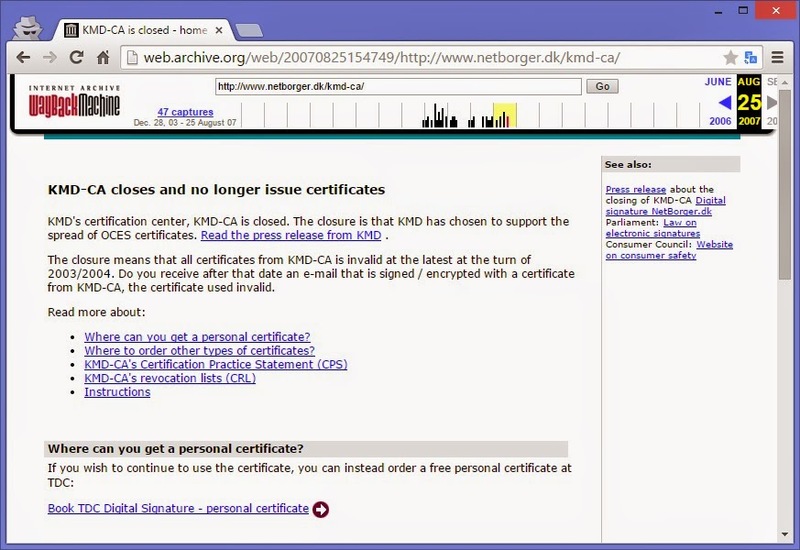 2 from KMD-CA.DK, a Danish CA that stopped issuing certificates in 2003/2004. Below is their web site as of 2007, the last time the Internet Archive captured it. I don't know why it took so long to remove, it appears one of the certificates was nearing expiration which triggered a review. Possibly the CA had issued 10 year SSL Certificates and Apple waited for those to age out, thankfully newer CABForum baseline requirements limit certificates to about three years (39 months). C=CO, O=Sociedad Cameral de Certificaci\xC3\xB3n Digital - Certic\xC3\xA1mara S.A., CN=AC Ra\xC3\xADz Certic\xC3\xA1mara S.A. Certificate Trust Lists (CTL) play a very important part in the internet trust ecosystem, known as the Internet Public Key Infrastructure. A CTL is a collections of certificates controlled by Certificate Authorities (CAs). There is a lot of focus on Certificate Authorities, particularly when one does something they should not. However, the manager of the CTL is typically the browser vendor - primarily Apple, Microsoft, or Mozilla. The browser vendor ultimately decides what CA Certs to preload into the browser/OS. Here I'll show some analysis of the Microsoft CTL, particularly changes that have been made recently. I'll focus on the Microsoft CTL because I think it has been a bit opaque. Microsoft has diverse requirements for their CTL, because it supports more usage patterns than Mozilla for example. Microsoft also has a customer base that includes governments and large organizations, which an independent organization might not be beholden to. But frankly, they haven't been updating it lately. Maybe they think their changes to the CTL are part of the Windows 10 Beta, but they are making changes on Windows Update which all clients that pull updates consume. "The Windows Server 2012 R2, Windows Server 2012, Windows 8.1, and Windows 8 operating systems include an automatic update mechanism that downloads certificate trust lists (CTLs) on a daily basis. In Windows Server 2012 R2 and Windows 8.1, additional capabilities are available to control how the CTLs are updated." In the current default configuration, Windows operating system pulls updates to the CTL automatically from Windows Update, using the "Update Root Certificates" component. This allows for responsiveness, in that a certificate can be revoked ("disallowed") quickly. However, the ability to automatically update the certificate trust list can give a bad impression if not done transparently. Microsoft could be acting more transparently. 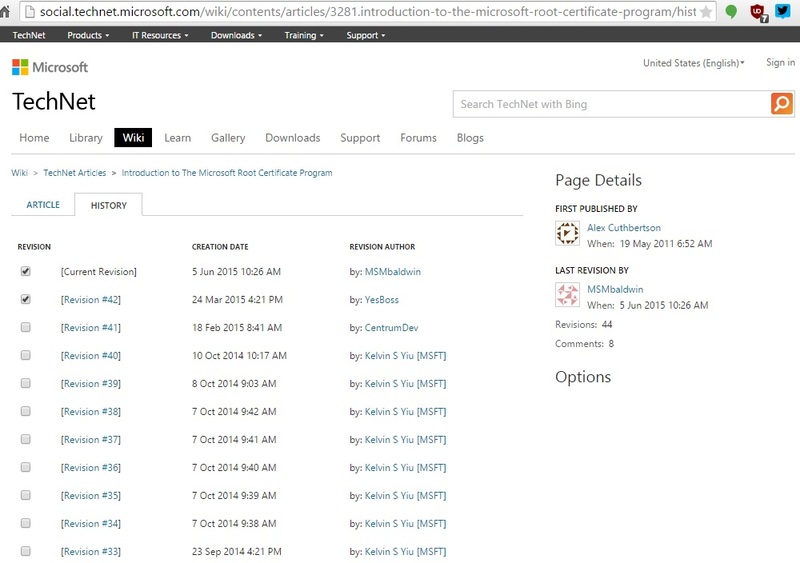 Last September, I was working with certutil and noticed that Microsoft had updated the CTL. The CTL is a critical component of Windows, so one would expect that some security bulletin would herald any change. One might expect this to happen on a regular interval, with advance notice so site administrators following NIST guidelines can validate that the CA Certificate is trustworthy. The last documented change to the Microsoft CTL was September 12, 2014, but it has been changed three times since. 1. September 12, 2014, Microsoft signed a new CTL. I noticed it on September 22. This included four new Certificate Authorities, and a lot of new CA certs. The new CA Certs were mostly to assist in the SHA2 migration, below are the new Certificate Authorities. "NEW September 29, 2014 - The September 2014 Root Certificates Update has been updated and the member list is available as a PDF document." New Certificate Authorities should be a point of interest, if not concern. Some people for example might not really want to trust the Government of Saudi Arabia, for various non-technical reasons. 2. January 22, 2015, Microsoft signed a new CTL. I downloaded this February 19. This update has still not been documented on Microsoft's website (linked above). This update included the elimination of one CA Cert, and the addition of seven new CA Certificates, four for existing CAs. Country: Panama, hosting in Curacao, Canadians outside Toronto. Comment: I had email discussions with an employee of TrustCor. They are a startup, have passed a WebTrust audit but not yet issuing certificates to the general public. 3. February 23, 2015, Microsoft signed a new CTL. I downloaded this on March 11. (I'm now checking daily). This was a very interesting change, because it reduced the number of CA certificates in the trust list from 417 to 354. Certificates were eliminated apparently for one of three reasons; expiration, protocol retirement (1024 bit), and cessation of business. The certificates removed for cessation were from AOL, DanID (Denmark), and Netaxis (France). This purge is a terrific step for Microsoft to take. I speculate that the work is associated with the Windows 10 development, which will also include adding certificate pinning directly to the trust store. Mozilla and Chrome do this, and Microsoft provides pinning constraints through the Enhanced Mitigation Experience Toolkit (EMET). 4. April 11, 2015. I was on vacation, so not checking every single day, but on April 11, 2015 I noticed that Microsoft updated the certificate trust list again. Oddly, the new file is also signed 2/23/2015 3:03PM. Clearly though the files are different, as the SHA1SUM tells us if you download it every day. This time 15 CA Certs were removed, 7 of which are 1024bit so easily explained, 8 others were 2048/4096, and not expired, so could benefit from explanation. CA Certificates removed in ~4/11 "stealth" update. It used to be cool to make certificates that say "Locality = Internet". Sorry Verisign, the Baseline Requirements now require you to submit to a Nation State! L=Bogota AV Calle 26 N 68D-35, C=CO, O=Entidad de Certificacion Digital Abierta Certicamara S.A., CN=CERTICAMARA S.A.
Over the next year, as SHA1 deprecation and Windows 10 release move closer, we can expect further efforts to clean up the CTL. There are a number of certificates with questionable cryptographic parameters (exponent 3, 1024bit, expired, no country, old CPS audits, etc). Plus, I can show how to make a verified cacert.pem with only the 307 certificats that are valid for SSL Server Authentication (i.e., excluding code signing/time stamping certs). I think Microsoft is making good progress, but just not explaining it to the world.